I have a confession to make: I used to be something of a watch snob. That's not so unusual for a guy as we only really get to wear one piece of 'jewelry'. I love mechanical, military style watches which are pretty understated and the opposite of hip-hop bling but the good, collectible ones can be pricey nonetheless. I have one or two nice watches that I like to wear for special occasions but even these ostensibly utilitarian timepieces require some care and maintenance. The most obvious issue is if they're not worn and/or wound regularly they don't even run. If they are not run regularly they tend to be less accurate and when they need to be restarted setting the time and date is a pain. There's nothing defines 'pointless' better than putting a watch on when you get up and looking at your wrist to see when the train is coming to find the hands haven't even started to move yet or it's obviously at least two hours off. Watches I own don't cost thousands but they do cost hundreds which means I'm a little precious about them when I go to the gym or work on my car and, no matter how careful I am, they do occasionally collect scratches to their case or glass that no one but I will notice but it drives me crazy anyway. So what is the point of a watch you're afraid to wear and isn't as accurate as your cell phone anyway? I do like to wear a watch. It feels natural to me when I want to know the time to refer to my wrist. I come from a generation where learning to tell the time and getting your first watch were rights of passage. I still remember every detail of my first watch, a child sized mechanical Timex I still have in the back of a drawer somewhere. I want to wear a watch but I want to bow out of the escalating horological arms race with my richer, more successful friends (I am the Miata to their 911s). I want it to work unconditionally, be cheap, unremarkable and tough. 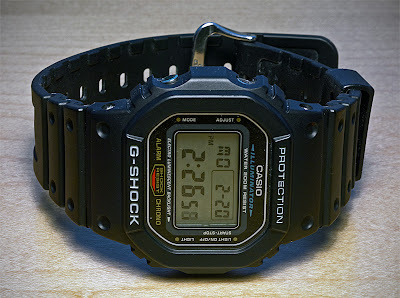 So, of course, there is only one choice; the G-Shock DW-5600E. I'm not talking about the collectable original version with the screw-down back and the Keanu-Speed association. I'm talking about the current version that costs less the $40 on Amazon. The watch that G-Shock aficionados deride and no one else even notices you're wearing. The watch that was one of four timepieces approved to go into space on the wrists of Shuttle astronauts. The watch you can bash into the wall and the wall will come off worse. A watch you put on and forget and abuse and it just keeps on going and looking exactly the same. I'm not talking about any of the limited edition versions in 'look at me me!' primary colors, or with reversed faces that look cool put are impossible to read, or advanced features to charge themselves from the sun or automatically set themselves. I'm talking about the cheapest G-Shock out there. The poor imitation (in collector's minds) and successor to the original G-Shock. The ultimate cheap, black plastic watch. It's a watch that draws no attention to itself but if you look at it closely has a rugged, utilitarian charm. It is chunky and substantial without being heavy or cumbersome. Its recessed face is protected and intuitive to read. Its integrated strap is supremely comfortable. The recessed buttons are protected from accidental use but responsive enough to work with work-gloves on when you need to. Its one flashy feature is its back light which works just long enough for you to read the time without compromising the long battery life. When the time finally comes to replace the battery it is almost a shock to the system that this watch needs any attention at all but removing the back just needs a common jeweler's screwdriver not a specialized watch back opener and it is the work of a couple of minutes to do the job. This watch is the antithesis of a fashion statement and so has a charm all of its own. There's a reason this watch is used and abused by astronauts, military personal, first responders, law enforcement etc. If you want to know what the toughest, most comfortable shoes are to wear all day are look at the feet of police people, nurses or chefs. They won't be the prettiest shoes but they will be practical to a fault. That should be the DW-5600E motto as well: practical to a fault. So why have I wasted so many words not reviewing a product that doesn't require another review anyway? Let's just say I am a fan. In a world that can be expensive and complicated it is what is is - I usually hate that conversation-killing statement but it seems totally apropos for the DW-5600E. There is nothing ironic, or political, or elitist, or hipster-cool, or over-sized machismo about this watch. It's more watch than 99% of us will ever need for much less money than we deserve to pay. ... it is what it is. that is why i brought gshock at PIJ for myself. I am very confident with the quality, no matter what am doing though it is quite expensive but its worth it. Compare to cheap but easy to break watch. 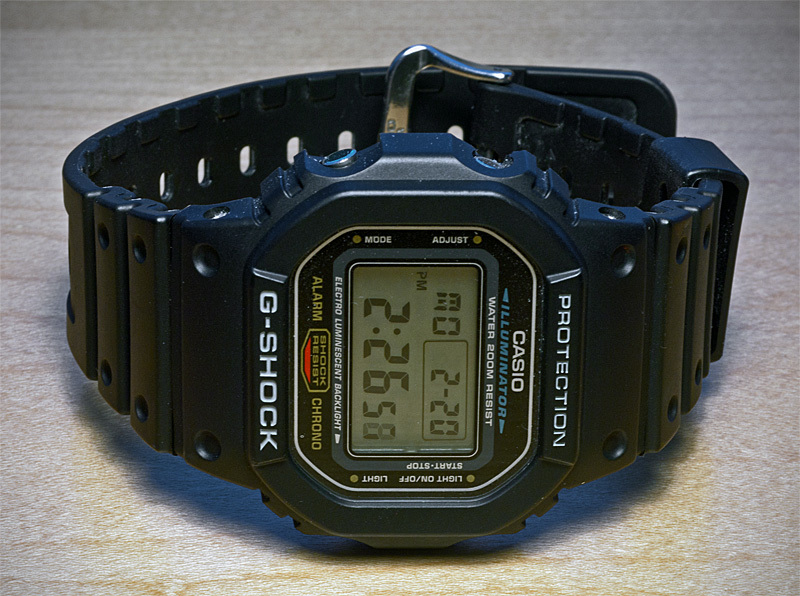 I wore many variants of this watch (the CBP) in the Singaporean army; not G-shocks but different black casios. Even found 1 or 2 on the floor of the jungle. LOL. These watches look so cool!! I think my husband would totally love that. I had that same ladies Timex and wore it to school like Linus in the Peanuts strip. You're spot on about the new G-Shock.